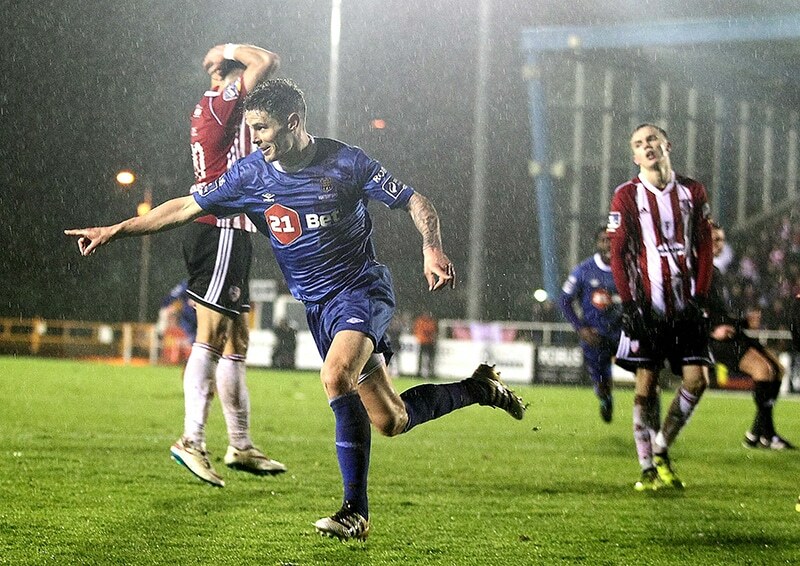 A magnificent team performance gave Waterford FC the ideal return to the SSE Airtricity Premier Division as Dean O’Halloran’s 77th minute finish after a most wonderful build up gave the Blues all three points against Derry City in front of a healthy 2502 crowd at the RSC on Friday night last. After the visitors struck the front inside the opening 20 minutes, the hosts didn’t panic as they tried to play football despite the heavy pitch. The game got the go ahead from referee Robert Hennessy after three inspections following a deluge of rain that left puddles of surface water that saw the groundstaff and volunteers working tirelessly to get the pitch playable. It was the Blues that started brightly when the game did get underway with Izzy Akinade racing down the right channel on five minutes before he was fouled but the resulting Garry Comerford free kick was punched away by visiting netminder Ger Doherty. Derry had their first chance soon afterwards when Darren Cole volleyed over the crossbar before the visitors shocked the home crowd with the breakthrough goal on 19 minutes. 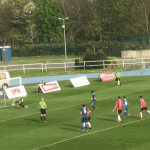 Aaron McEneff whipped in a left-wing delivery that found the head of the unmarked Armin Aganovic and he beat keeper Niall Corbet from six yards. Garry Comerford sent a free kick from the right side after another foul on Akinade over the bar before the Blues levelled the tie on 43 minutes. A brilliant move involving Bastien Héry and Rory Feely saw the latter fed the ball through for Gavan Holohan and he went on a great run before drilling a low shot under keeper Doherty. Izzy Akinade carved out the first chance of the second half on 52 minutes when he got to the front post to meet a right-wing delivery from Rory Feely but he headed inches wide of the target before Ben Doherty fired over from distance after a slip in the Blues defence. The RSC was rocking on 77 minutes as the Blues scored the winning goal when some outstanding first touch football saw Stanley Aborah’s majestic backheel set up Garry Comerford down the left and Dean O’Halloran hammered home his cross at the back post. 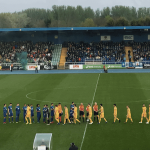 Although one would have expected Derry City to pile on the pressure in the hope of finding an equalising goal, it was anything but as the Blues went looking for a third goal with parrying away an effort from Dean O’Halloran in second half injury time. It was a brilliant night at the sound of the final whistle as the Blues fans celebrating their return to the top flight with victory. Roll on Turner’s Cross next Friday night.